Unionville High School’s boys tennis team completed a fought straight perfect season in the Ches Mont, with a win over West Chester East, Tuesday. No. 1 singles player Johnny Wu follows through on a serve. 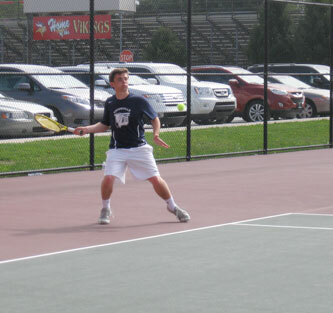 WEST CHESTER — The Unionville High School boys’ tennis team completed its fourth straight undefeated romp through the Ches-Mont League by defeating the host West Chester East Vikings Tuesday. 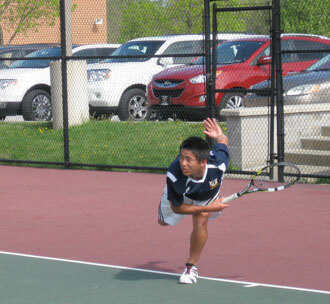 The Indians were led by Johnny Wu, who rolled to a 6-0, 6-1 victory over Saran Viswanathan at first singles. Peter Mason gutted out a tough match at third singles, prevailing 7-5, 6-3, over Christian Aksu. The team has not lost a league match since the 2009 season, and looks to carry that momentum into the District I Class AAA team tournament next week. Unionville first doubles player and co-captain Jeremy Waterkotte smacks a forehand. The lone blemish on the match for the Indians was Ross Fitzsimons’s 6-1, 6-3 defeat at second singles at the hands of Daniel Fisher. Singles: Wu (U) def. Viswanathan (E), 6-0, 6-1; Fisher (E) def Fitzsimons (U), 6-1, 6-3; Mason (U) def. Aksu (E), 7-5, 6-3. Doubles: Waterkotte/Garlapati (U) def. Goyal/Fleming (E), 6-0, 6-2; Jiang/Sciscione (U) def. Ebersol/Hunt (E), 6-2, 6-0; Dupuis/Witherell (U) def. Manoj/Delany (E), 6-0, 6-1; Zaki/Son (U) def Brady/Reilly (E), 6-2, 7-6 (4).